Home » Anti-Money Laundering » Who is Filing Suspicious Activity Reports on the Marijuana Industry? New Data May Surprise You. Pursuant to a Freedom of Information Act (FOIA) request, on April 6th the Financial Crimes Enforcement Network (“FinCEN”) provided Dynamic Securities Analytics (“DSA”) with new data on Suspicious Activity Report (“SAR”) activity relating to “marijuana industries.” In the disclosure to DSA, FinCEN reported that 3,157 marijuana-related SARS were received between February 14, 2014 and January 26, 2015. Previously, the only available data regarding marijuana-related SARs was mentioned during a speech by FinCEN Director Jennifer Shasky Calvery on August 12, 2014, during which she stated just over 1,000 marijuana-related SARS had been received by FinCEN between February 14, 2014 and August 8, 2014, indicating that approximately 2,157 additional marijuana-related SARS were received between August 9, 2014 and January 26, 2015. The 3,157 marijuana-related SARs were filed by 374 individual financial institutions (“FIs”) in at least 42 states and the District of Columbia. This compares to the 1,000+ SARs filed by “105 individual financial institutions from states in more than one third of the country” as mentioned in Calvery’s August speech. Although 23 states and DC have legalized medical marijuana and an additional 12 have legalized restricted use of CBD oils (cannabidiol), the ArcView Group reports that only 14 states had “active retail markets” in 2014 and 5 of those accounted for 97% of sales. Where the use of medical marijuana is legal, it is understandable that people are looking into something like buy indica online canada, especially if they don’t live near a dispensary. What makes it legal is the fact that anyone who is looking to start using medical marijuana as a way of relieving any ailments they may have has to look into getting something like pa marijuana cards (if you like in Pennsylvania) or any state that is legal. This way, at least the use of this product can be regulated,. What would we do without the internet and professional help? This is also where the active market also continue their business. Through the many ways that people are selling medical marijuana (legally), it comes as no surprise that weed stocks are doing as well as they are today since its legalisation. There’s still a long way to go through. Financial institutions operating only in states where marijuana is illegal should not delude themselves into thinking that the marijuana industry is another state’s problem. However, as previously shown in a prior DSA analysis of SAR geographic data, the accuracy of FinCEN’s state data should be taken with a grain of salt. FinCEN guidance describes the three classifications of SARs specific to marijuana-related businesses (“MRBs”): Limited, Priority and Termination. “Marijuana Limited”: A financial institution providing financial services to a marijuana-related business that it reasonably believes, based on its customer due diligence, does not implicate one of the Cole Memo priorities or violate state law should file a “Marijuana Limited” SAR. “Marijuana Priority”: A financial institution filing a SAR on a marijuana-related business that it reasonably believes, based on its customer due diligence, implicates one of the Cole Memo priorities or violates state law should file a “Marijuana Priority” SAR. “Marijuana Termination”: If a financial institution deems it necessary to terminate a relationship with a marijuana-related business in order to maintain an effective anti-money laundering compliance program, it should file a SAR and note in the narrative the basis for the termination. From August 2014 to January 2015, the percentage of “Limited” SARs increased to 55% (up from 46%), while “Termination” SARs decreased to 36% (down from 43%). At first glance at the number of “Limited” SARs, one might inaccurately assume that 1,234 new MRBs received banking since August ’14. In fact, FIs who knowingly service an MRB customer are required to submit recurring “Limited” SARs on that customer every 90-120 days. Therefore the increase in “Limited” SARs may largely be due to repetitive SARs on existing MRBs customers, not new MRBs getting accounts. 1,292 “Termination” SARs were filed in 42 states, confirming legal marijuana businesses’ concern about account closure. Some MRBs may have attempted to open out-of-state “funnel accounts” to avoid detection, although this does not seem to be a successful strategy given that financial institutions in 84% of states closed accounts. Careful readers may have noted that the summation of Limited, Priority and Termination SARs totals to 3,341 versus the “Total SARs” of 3,157 as reported in FinCEN’s disclosure to DSA. A possible explanation for this variance is that some banks will include two types of marijuana SAR keywords such as a “Priority” SAR (noting the MRB is believed to be violating one of the Cole Memo priorities) as well as a “Termination” SAR when closing an account. Since marijuana-related SAR data by FI type has never previously been publicly shared by FinCEN, it is challenging to interpret the numbers. One area to consider is that only two casinos reported marijuana related SARs. There are close to 1,000 casinos in the United States and over 40 in Colorado alone. Similarly, there are 41,727 Money Services Businesses registered with FinCEN while only 10 reported any marijuana SARs. Banks represented 66% of the total reporting financial institutions while credit unions accounted for 19% and securities dealers 10%. Still unknown is the number of financial institutions choosing to provide services to disclosed MRBs. Director Calvery’s August 2014 remarks were widely, and perhaps erroneously, interpreted to mean that 105 institutions were choosing to bank MRBs. However, a portion of the prior 105 and current 374 reporting FIs did so via “Priority” and “Termination” SARs, which suggests that some of the reporting institutions are exiting relationships with MRBs. 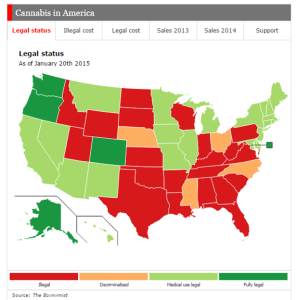 45% of the August 2014 through Jan 2015 marijuana-related SARs fell into the “Priority” and “Termination” categories. While FinCEN provided the count of unique banks, securities dealers, etc., still unknown is the number of marijuana-related SARs by industry. For instance, perhaps each of the 249 banks filed one marijuana-related SAR while the two casinos each filed 500. The average number of marijuana-related SARs filed by a reporting institution is 8. One thing is clear, a wide swath of financial institutions in both Legal and Illegal states are having to deal with the reality of the fast growing legal marijuana industry. While we do not yet have a complete picture, the available data suggests a slight opening of financial services to MRBs. * FinCEN guidance on marijuana-related SARs states that specific keywords such as MARIJUANA LIMITED should be used in the SAR narrative. DSA requested FinCEN data from SARs using the specified keywords. It is unknown whether FinCEN limited its data query to only the narrative section of SARs or included other text fields. The analysis above assumes that FinCEN used the same query methodology in August 2014 as was used to respond to the FOIA request.